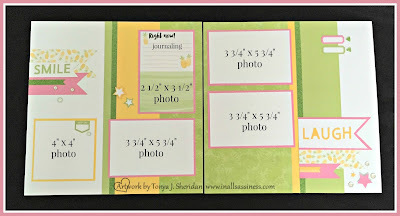 Class Kits: All kits have step by step details instructions included and include a color copy of the layout. Combined Shipping: should you wish to purchase multiple kits, you just pay the cost for the first layout ($8.00). 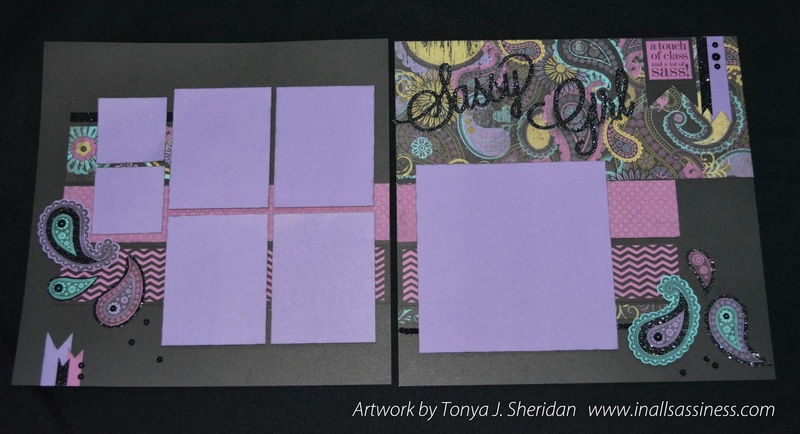 Layout kits may be purchased in my In All Sassiness Shop by clicking here. 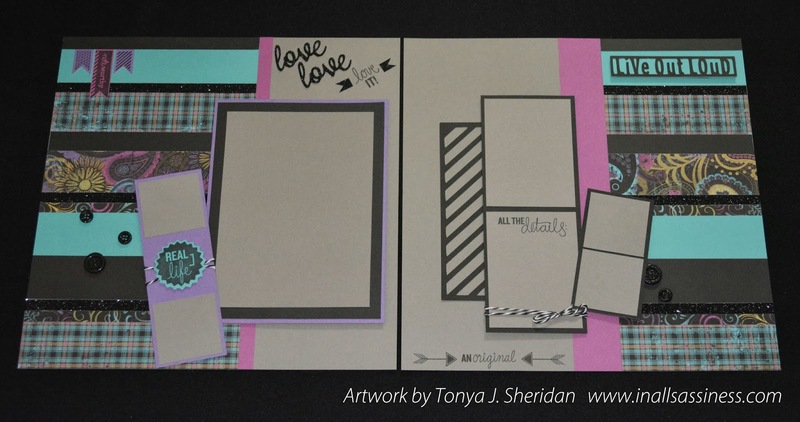 With this kit, you will be learning to create a layout from a 4" x 6" My Crush Book. 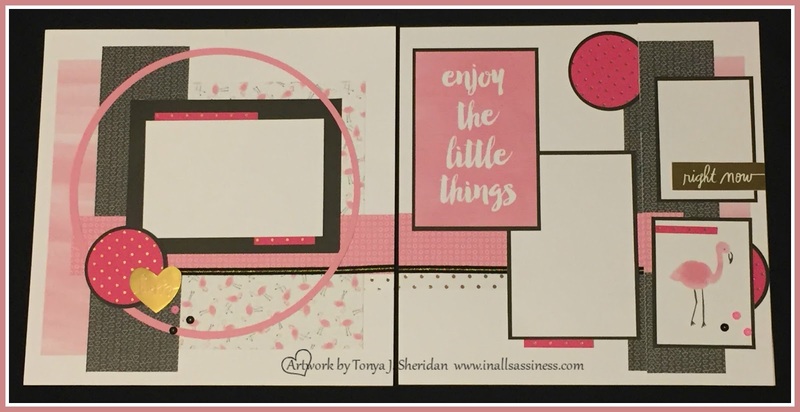 You will learn to use smaller pieces of pattern to create a 12" x 12" layout. Fun right? The kit is $15 and includes a full 4" x 6" spiral My Crush For Her Book (which you will have lots of left overs to create additional projects with), needed cardstock to create layout as well as bulk sequins, Flip Flaps, Shimmer Trim and Baker's Twine. In addition, you will receive detailed instructions with cutting guides and a colored picture. 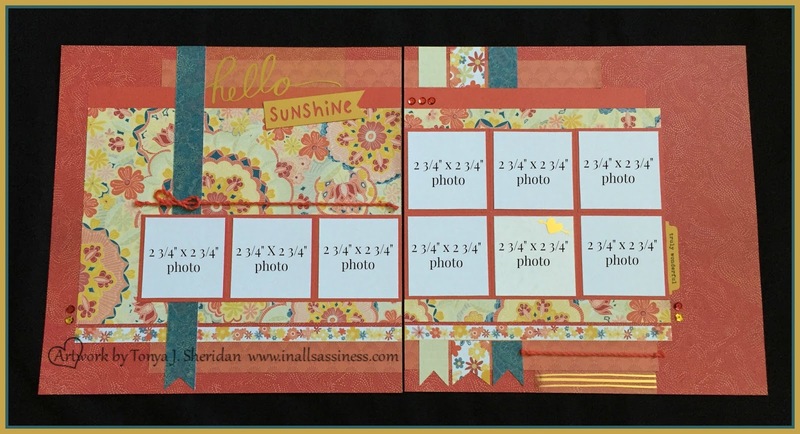 To see more details of this layout, click here. To order this kit, visit my In All Sassiness Shop. This class will guide you in creating the Happy Hello Layout that graces page 78 of the 2016-2017 Annual Inspirations Idea Book. 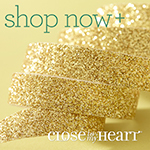 While creating, you will learn to use the new All About the Gold 12" overlays and our new Thin Cuts. 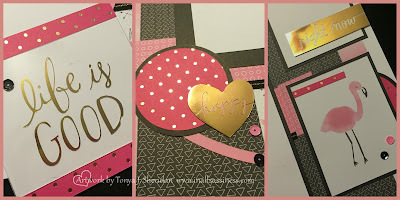 The kits include all needed cardstock, pre-cut stars and words, additional needed pieces, a full pack of Gold Sequins, 1/2 sheet of the All About the Gold Overlay, detailed instructions and a colored photo. The kit is $15.00 or $20.00 with a Bonding Memories Glue Pen (which I highly recommend to adhere stars with). Shipping, if applicable is $8.00. To see more images of the layout, click here. Click here to order in my shop. Get your sparkle on with this tropical summer layout! The pineapple isn't just for the islander in you, but in Virginia, it is also the symbol of hospitality.The kit includes: 25 inches of (Z3087) Green Shimmer Trim, bulk (Z2013) Silver Sequins, bulk (Z3123) Green Enamel and Glitter Duos, 2 sheets of (1385) White Daisy Cardstock, 1 sheet (Z3127) Canary Paper Fundamentals (from Whimsy Fundamentals), 1 sheet of (X5773) Pixie Cardstock, 1 sheet (X5639) Sweet Leaf Cardstock, (Z3165) Whimsy Fundamental Assortment, bulk (X7210B) Calypso Pineapple paper, 1 sheet Calypso patterned paper, detailed instructions and a color photo. The kit is $15.00. Click here to order in my shop. To see a larger image, click on the picture and it will open in a new window in a larger size. To see more images of the layout, click here. Warm tones, vibrant gold and metallic accents pair together to create this colorful layout. 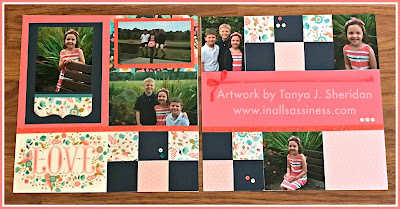 This layout kit includes bases, pre-cut pieces, pre-cut Cricut titles (as well as two alternate titles -- "fabulous" and "Autumn"), bulk sequins, 2 Gold Overlays, bulk baker's twine, detailed instructions and a color photo. The kit is $12.00 and may be purchased by clicking on this link. Shipping, if applicable, is $8.00 and can be combined with other kits during the same transaction. Click here to order in my shop. To see a larger image, click on the picture and it will open in a new window in a larger size. Flaired with sass, this layout is "flamanging"! Gold accents and bold pink shades will most certainly aide you into creating a pink masterpiece. This layout kit includes the bases and page protectors, pre-cut pieces, flip flaps, bulk sequins and overlays. The kit is $15.00 and may be purchased by clicking on this link. Shipping, if applicable, is $8.00. Click here to order in my shop. Full spread with large flip flap closed. Full spread with large flip flap open. This layout is full of bling, sparkle, and of course sass! 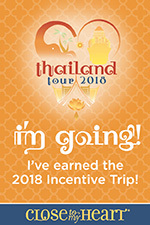 The kit includes: Laughing Lola Paper, black Glitter Paper, needed flip-flaps and page protectors, pre-cut Cricut pieces, pre-stamped elements (can be reversed if you choose not to use the stamped images), pre-cut pieces to complete layout, 3" x 4" flip flaps, bulk Black Shimmer Trim, a pack of Black Mini-Medleys, detailed step by step instructions and a colored picture of the layout being created. Kit cost is $15.00. Shipping, if applicable is $8.00 and may be combined with other kits to save on cost. To see the original details of the Sassy Girl layout, click here. Click here to purchase in my shop. This layout is full of bling, sparkle, and of course sass! 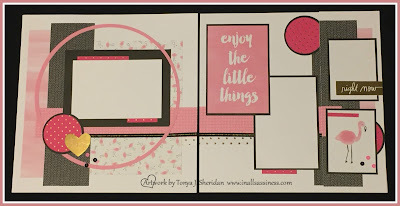 The kit includes: Laughing Lola Paper, needed flip-flaps and page protectors, pre-cut Cricut pieces, pre-stamped elements (can be reversed if you choose not to use the stamped images), pre-cut pieces to complete layout, 3" x 4" flip flaps, bulk Black Shimmer Trim, bulk Black Mini-Medleys, detailed step by step instructions and a colored picture of the layout being created. Kit cost is $12.00. Shipping, if applicable is $8.00, and may be combined with other kits to save on shipping cost. To see the original details of the Love, Love, Love It layout, click here. Click here to purchase in my shop. I love all of your projects you have displayed here. Now to try to decide what I want to order first!